17-year-old Luisa finds herself soothed by the dark. The nocturnal. By subterranean Mexico City, where she lives. She refers to night as “the aquarium of the dream”, in which her ideas, visions and fantasies are framed: lives she could lead, people she could meet, places she could go. 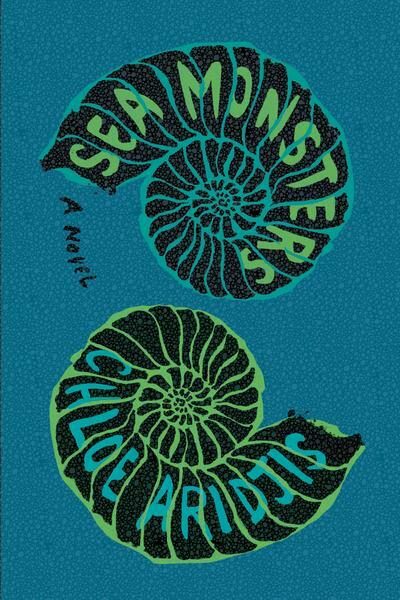 “Remember, [Luisa’s father would] say, society is like a fish tank, only less beautiful to watch.” It’s 1988, and in the run-up to the events Luisa describes in Sea Monsters, the third novel from Prix du Premier Roman Étranger and Guggenheim Fellowship winner Chloe Aridjis, Luisa’s aquarium is inhabited by Tomás Román, a 19-year-old dropout with a “lunar” face who exists “in the periphery, on a parallel plane”, and whose name Luisa scribbles in the margins of schoolbooks as she tries to decipher him. Luisa’s daydreaming transports her from Tacubaya, an impoverished area of Mexico City where she goes to college, and La Roma, where she lives with her parents, towards another realm. A sunken realm. It relieves her from the tediousness of her wealthy peers, whose parents are politicians, industrialists or Americans working for transnational companies – rich and absent enough to employ bodyguards to do the school run, and the purgatory in which she exists at home. Her father, she says, “was in constant search of paths of communication that led away from ourselves”, while her mother did little more than fret about money. But unlike her classmates, the absentee in Luisa’s household is neither her mother nor father. Luisa lies. Luisa leaves. Luisa is a teenager, bored, impatient and stuck in a cycle of mind-numbing parties, cocaine racked in ammonite spirals and sleazy bars where women don’t pay for drinks, but in accepting them for free end up paying a much higher price in male expectation. When asked to pick a Baudelaire poem to analyse by a teacher, Luisa chooses Un Voyage à Cythère, A Voyage to Cythera, or Kythera, the fabled island off the Peloponnese. ‘My heart like a bird was fluttering joyously/and soaring freely around the rigging’, the narrator recalls, until observing the island, which appears to be no more than a black rock. Allegedly the birthplace of Aphrodite, what the narrator sees while looking at Kythera is not ‘a temple in the shade of a grove/Where the youthful priestess, amorous of flowers/Was walking’ but the ruined body of a hanged man dangling from a gallows. In the dead man’s image the narrator sees himself; in Kythera’s, Luisa sees a black heart. A rotten place. An island stuck between birth and death, only kept alive by the lapping of the tide on its shore. Luisa admits that the only way her father, an academic, has of keeping her interested in the ancient world is through his stories of shipwrecks. Of skeletal structures half-buried on the seabed. Antikythera Island lies southwest of its namesake and between them flows the Kythera Strait. Treacherous, with strong seismic activity, the Strait has claimed many vessels, including the Antikythera Wreck, which, on its final voyage in the 1st Century BC, was transporting statues, amphorae and the Antikythera Mechanism – an Ancient Greek computer used to predict astronomical positions. The sea is a lurking presence in Sea Monsters. It is a matriarch bearing children from the depths to the shore and back again. A tree depositing fruit on the forest floor, only to watch it rot . The sea is adventure, and it is risk. It is Death. And to it Luisa is drawn. Her secret journey with Tomás to Zipolite, in the coastal state of Oaxaca, is veiled as an attempt to locate a troupe of Ukrainian dwarves who’ve escaped there from their ringmaster whilst on tour in Mexico. To Luisa they represent the European continent to which she longs to travel but which is as unreachable as the deepest ocean floor. At the beginning of their journey, Zipolite’s sea is inviting and full of all the possibility and romance of the horizon. It feeds Luisa’s desire for change, but soon she looks upon it as “vast and indifferent as a cathedral”. The sand becomes the “Beach of the dead” into which Luisa’s expectations of her relationship with Tomàs sink, in the same way her relationship with her parents became, at least to her, as fractured as the place in which they live. It is a time of transition for Mexico City, as it slowly recovers from in the aftermath of the 1985 earthquake that split its concrete and reduced its buildings to ruin. Aridjis asks the question ‘what comes after?’ and it is as if the Antikythera Mechanism has already predicted the answer, and Luisa’s next move, but has decided not to tell her. In Sea Monsters there’s a symbiotic relationship between the cracked, dry concrete of Mexico City and the earth it was built on. Nature pushes its way between slabs, roots writhing beneath roads, intestines moving digested food, or maggots inside the corpse of a creature that died of old age. The sea at Zipolite and the people staying there have a similar relationship: they exist on its shore, gazing out from behind café tables, hammocks in palapas and from around bonfires, as if waiting to return to the womb. But that place does not exist, not in the way Luisa first imagines it. And it doesn’t take long for Luisa to realise that the idea she had of who Tomás might be was false. The Merman, however, is much older than Luisa. He’s attractive, alluring, and sits with her in silence, while she offloads everything upon him only metres from the shore. The allure of the sea is as tangible as the sexual energy with which Aridjis has charged Luisa’s observations. Despite the stories of foreign poets and indigenous girls drowning nearby, to Luisa the waves resemble ‘rows of muscular men with interlocking arms’; male sirens calling her to a watery grave. Thus Luisa turns the Merman into the one of the statues from Antikytheria wreck: submerged, mysterious and destined to disappoint her too. Luisa, meanwhile, becomes the Antikythera Mechanism itself – complex and indecipherable, lost somewhere between the classical period and the age of smartphones, in a transient world approaching the 21st Century and already turning the Cold War into a memory. Aridjis’s writing meanders between the beautifully poetic and achingly impatient, her characters existing in the margins of fantasy, perpetually covered in sand. It is as though they are neither flora nor fauna, neither land nor sea. Luisa is moveable, fragile as sandcastles, and stubborn as the tide. Her breath, her sweat, the footprints she leaves is as much an intrusion on nature as the plants and animals returning to Mexico City is on civilization. Both polar opposites, both seeking a return. A reconciliation. A connection with the ancient and the natural and an escape from a politically and geographically compromised society, which doesn’t seem to have a place for either of them. Except it does, and it took getting out of herself to understand that Tomás and her friends in Mexico City, whose existence as emancipated teens she spent years romanticising, don’t have what she does: the security of home and the parents who built it. What, then, do they fantasise about? Having parents who are present? Not living in buildings with cracked walls that threaten to fall at a moment’s notice? In Zipolite, Luisa doesn’t find the Ukrainian dwarves, though she thinks she glimpses them late one night. “The Dwarves were everywhere and nowhere,” she says, realising that they always will be. The fact that her journey starts out as a massive, frightening, exciting undertaking that becomes no more than a footnote in just a few days allows the journey of her parents to ascend in prominence and take them out of the realm of routine and domestic mundanity. In searching for their missing daughter, their quest has jeopardy, something real to lose, potentially forever, and something they can physically hold if they succeed. What Luisa does find in Zipolite is the knowledge that whilst she was off with Tomás and the Merman, all of this was happening back home. All of this was real to people she disregarded. It’s knowledge that she didn’t know she could have. And this, the sand, the sea, the decayed ruins of the old homes in Mexico City, and her sexuality and experience as a young woman, become the place she inhabits, and the self she carries, for now. Chloe Aridjis is a Mexican American Writer who was born in New York and grew up in the Netherlands and Mexico. After completing her Ph.D. at the University of Oxford in nineteenth-century French poetry and magic shows, she lived for nearly six years in Berlin. Her debut novel, Book of Clouds, has been published in eight languages and won the Prix du Premier Roman Étranger in France. Aridjis sometimes writes about art and insomnia and was a guest curator at Tate Liverpool. In 2014, she was awarded a Guggenheim Fellowship. She lives in London. Posted in Book reviews and tagged chloe aridjis, harry gallon. Bookmark the permalink.